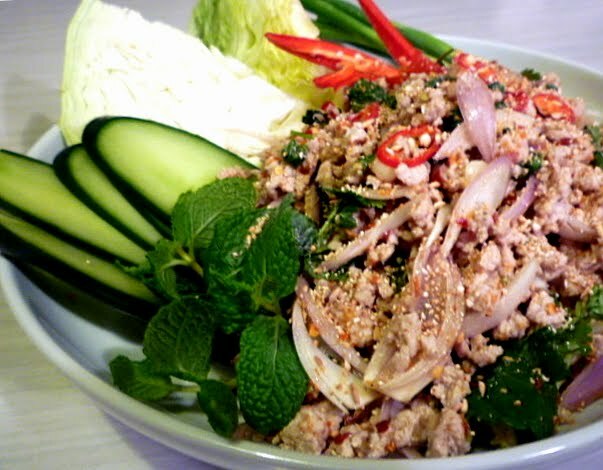 Laotian cuisine is a combination of fresh herbs, mixed spices, and strong flavors. It has influences from all kinds of Asian cultures, but the main influences are from the surrounding Southeast countries such as Thailand, Vietnam, and more. 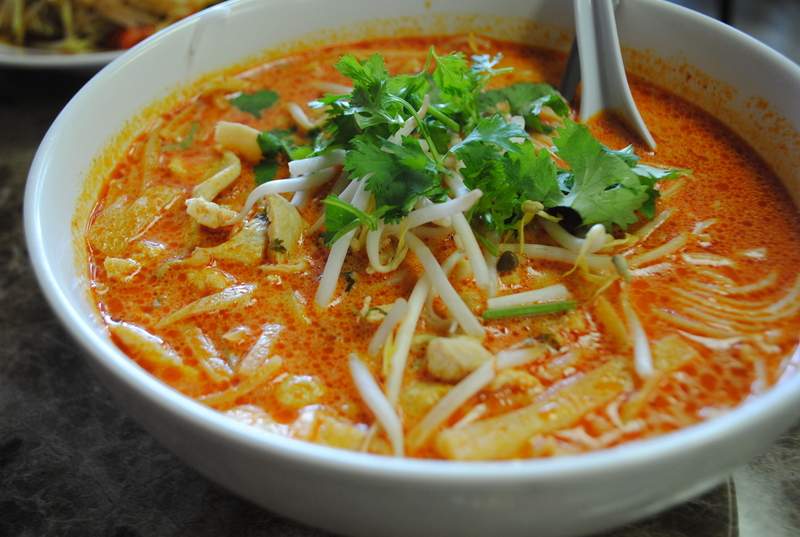 Laotian cuisine is focused on using fresh ingredients and using them in many different ways (such as making a lemon grass broth to a coconut based curry). 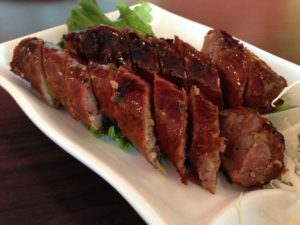 Listed down below are some highlights from the Laotian cuisine that you should try out! 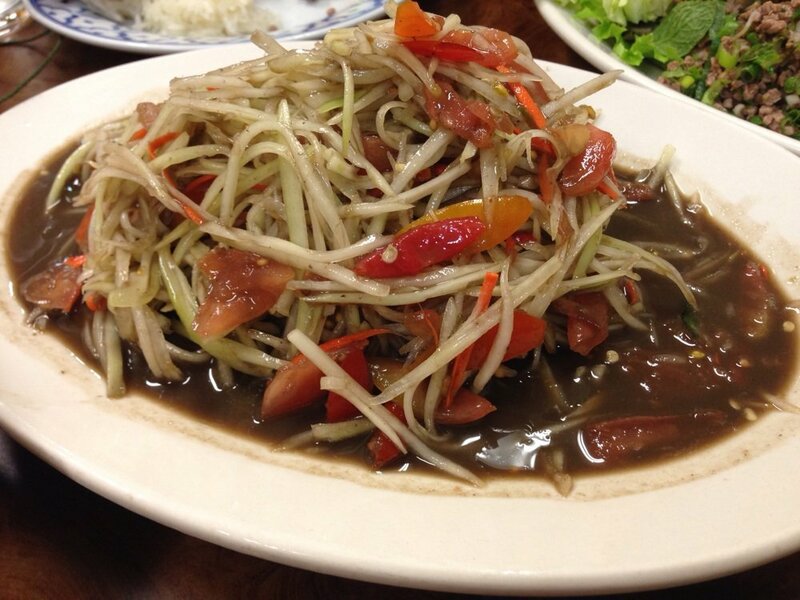 A papaya salad is made from the fruit papaya where its combined with a blend of spicy, salty, and semi-sweet flavors. There are two different version of the papaya salad, Lao and Thai style. It can vary in texture and some ingredients. But the distinctive flavor of the Lao style is the padek (fermented fish/brown sauce) which isn’t commonly found in the Thai style. The common recipe includes shredded (unripe) papaya, Thai chilies, fish sauce, lime, red cherry tomatoes, and garlic. Recipe is linked here! This dish contains herbs and spices that can be mixed with a variety of meat (usually beef or chicken is used). People usually eat this with sticky rice, lettuce, or cabbage. It can make up for a good snack or an entire meal. It’s distinct freshness comes from the basil and mint. It is also mixed with peppers, green onions, cilantros, garlic, lime juice, and more. Check out the recipe here! A noodle dish with a coconut based curry (usually combined with a chicken broth) and is made with vermicelli noodles. There are many variations to this dish as one can customize theingredients to their preferences. A highlight are the fresh ingredients such as banana flower, bean sprouts, basil, green onions, bamboo shoots, and cilantros. The flavors are customized by using fish sauce, salt, and the broth itself. Check out the recipe here! 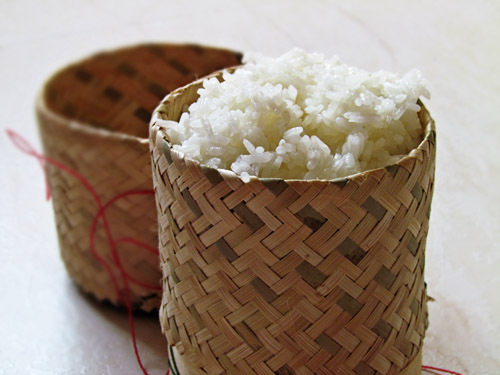 The texture of sticky rice is different from other rice because it has a different texture and it sticks together much more compare to other rices. It can be eaten as it is with other dishes or as a desert by serving it with mango and coconut cream. Recipe! Known for its red color and spicy flavors, the Lao sausage is different from other sausages. You would have to taste it for yourself because it has a unique taste. It can be fried, steamed, and grilled. It is made with minced pork, shallots, peppers, garlic, lemongrass, and more! Check out the full recipe here! 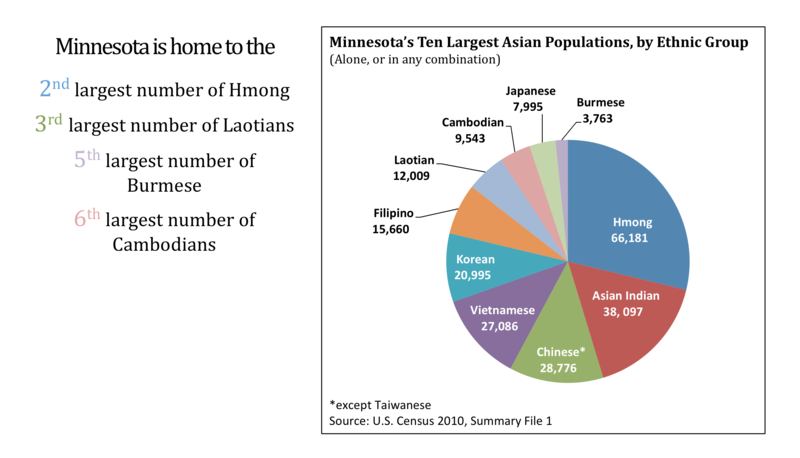 According to the 2010 U.S. Census the eight largest Asian American populations in Minnesota are the Hmong, Asian Indian, Chinese, Vietnamese, Korean, Filipino, Laotian, and Cambodian community. 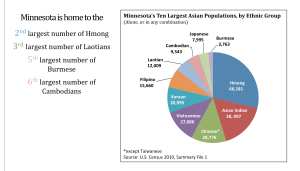 Specifically, 27 percent of the total population identify themselves as Hmong, 15.5 percent are Asian Indian, 11.7 percent are Chinese, 11.1 percent are Vietnamese, 4.9 percent are Laotians, and 3.9 percent are Cambodians (See Figure 2). Minnesota is home to over 40 different Asian Pacific Minnesotan immigrant and refugee communities. Each community has its own strengths and challenges that may be unique to that ethnic community. 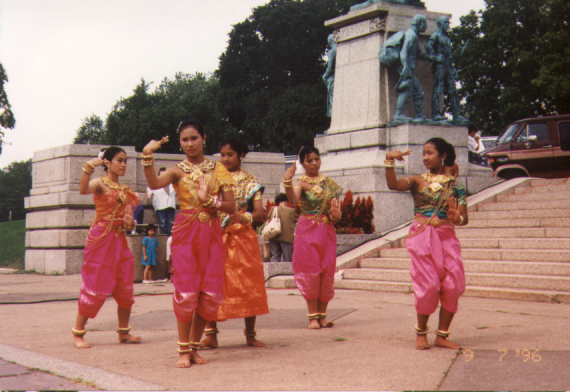 The following is an overview of how the Laotian community is faring in Minnesota. Following a similar path as other AAPI refugees displaced by the Vietnam War, the Laotian community arrived in Minnesota in the late 1970s and 1980s to rebuild their lives. [i] Approximately 12,000 Laotians live in mostly urban counties in the Twin Cities and earn a median income of $40,000, which is the lowest income range among all eight AAPI ethnic communities. Laotian Americans have high unemployment rates at 12.7 percent. Over 40 percent of the Laotian population earned less than a high school diploma.i APA ComMNet REACH CORE project staff and volunteers met with Laotian American community members and leaders throughout the Twin Cities to understand the community’s strengths, challenges and other social and environmental factors affecting its overall health and wellbeing. Laotian Americans who participated in this project stated that their strong family and community connections are important in improving the health and wellbeing of their community. Family members rely on each other for support and often visit with one another to talk about issues affecting their family or community. 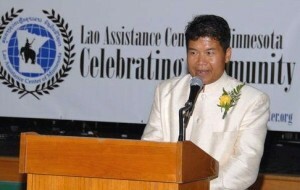 Sunny Chanthanouvong, Executive Director of the Lao Assistance Center, stated in his key informant interview that health information is usually spread using family and community network. Knowledge about diseases and preventive health practices are often communicated through storytelling and discussions during small get-togethers or at large community events. “We talk about sickness and health, we talk about the need for people to get exercise and eat healthy,” said Sunny Chanthanouvong who added that good as well as bad experiences of community members when dealing with health issues are often shared with one another. Laotian Americans indicated that many in their community live in distressed neighborhoods and physical exercise as well as healthy eating habits may sometimes be difficult for members of the community. Due to their relatively recent introduction to the American health care system, some Laotian Americans may not be familiar with preventive practices to deter diseases or how certain disease can spread through different channels. Sunny Chanthanouvong explained how his organization attempts to educate Laotian Americans on flu prevention. In addition, APA ComMNet Health survey results show that the Laotian American community exhibited high tobacco use with nearly 30 percent of Laotian Americans stating that they frequently smoked cigarettes (Figure 3). Anecdotally, Laotian Americans also indicated that alcohol use was prevalent in the community especially during family and community celebrations despite the lack of evidence from this study affirming this notion. Laotian Americans added that smoking and drinking are common practices in Laos and young Laotian Americans who were raised in the U.S. often see their parents drink alcohol and smoke cigarettes leading many Laotian American youth to believe that such behaviors are normal and adopt their parents’ addictive habits as their own.